Built in 1889, The building served as the City Hall, A Theater , a Fire House , Police Station and two jails. They actually do. Countless audible moans cries and singing can be heard with regularity. A little girl can be heard meowing like a kitten and piano music can be heard at times as well. Footsteps can be heard in the balconies. Balls of light emanate beneath the seats and throughout the theater area. Several full bodied apparitions have been captured on camera, Countless EVP's have been captured including one of our child spirit, Andy who can be heard singing, saying hi and other commentary as you wander through the theater. Andy is capable at moving objects such as cameras and balls. The balls often disappear. He also likes to pop balloons. among the 18 or so spirits that inhabit the place. 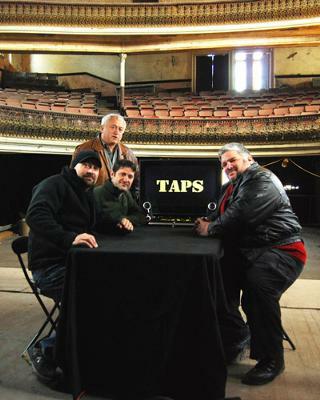 Richard Felix (Most Haunted)had his crew from England in there during the day where he capture a spectacular full bodied apparition of a woman in a teal colored, victorian style dress in one of the understage dressing rooms. 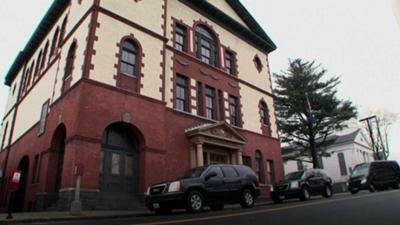 The building has also recently appeared on an episode of Ghost Hunters. They found several things, including Andy. They chased shadow figures in the jail cells and balls of light under the seats in the balcony that they could not explain. Therefor the items did not air though may appear on the DVD of the show due out soon. Jason's dog "Maggie" was mesmerized by the spirit of a woman who haunts a specific seat in the balcony. The dog was brought to different parts of the building and was let loose only to return to the same seat over and over. The show was cut in half and the evidence was cut down to a few interesting items , however the building has absolutely NO ELECTRICITY, yet it has the highest magnetic field readings of any structure ever to appear on the program. I have been personally scratched after tormenting a spirit in one of the jail cells, People have been tripped and pushed, touched...You name it , It is here. The place is just as active in the day than it is at night. Special permission is needed to go in there and a donation towards the group that is helping to restore the structure is required. Google the Sterling Opera house to see some evidence and press etc... There have been many things that occurred in there a few deaths, including a murder/suicide. Many happy moments including a wedding, graduations and general Folly. It's a very impressive theater which is currently under restoration which ads to the activity that goes on in there. On a scale of one to ten, ten being most active...this place is off the charts.